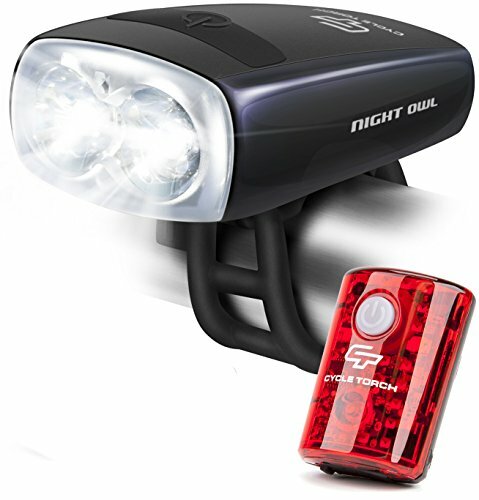 YOUR SEARCH FOR A FRONT AND BACK BIKE LIGHT COMBO ENDS HERE! charges from any computer, laptop or other device with a USB port. 200 Real Lumens, So bright that it will light your way up to 200 Feet, making you visible Miles away, See the images! Can be used for a wide range of activities: road biking, city commuting, hybrid bikes, kids bikes. Equipped with a specially designed elastic rubber band to cover a big variety of handle bars. Compact and light weight with only 80gr. What's inside the Night Owl box? How about 1 Year No BS 100% satisfaction guaranteed Warranty against ANYTHING! ⚡ SAVE YOUR MONEY DAY TO DAY - With this USB rechargeable front bike light, all you need is a USB cord (included) The Night Owl Bicycle Light comes with Smart Charging Technology and has Runtime of 2+ hours on High, making it a Top of the line light. ⚡ DAYTIME RUNNING READY - Bike Lights are not for Night Only, around 80% of cycling accidents occur in daylight!! Thanks to our Specially Engineered Lens and 200 Real Lumens, it will keep you and your Loved ones Safe day or night! - 360 DEGREE PROTECTION -Free USB Rechargeable LED Taillight Included. ⚡ ATTACHES IN SECONDS - Leave your Tools for Bike repairs, Night Owl bicycle light has universal fit, doesn't matter what bike you're riding, we've got you covered! Also good for strollers, kids bicycles & scooters, camping, family activities and more. ⚡ SUPER LIGHT WEIGHT & WATER RESISTANT - When performance matters and each extra gram is important, Night Owl is the best partner with Just 80 Grams and IPX5 Rated, meaning 100% covered if you get caught in the rain. If you have any questions about this product by Cycle Torch, contact us by completing and submitting the form below. If you are looking for a specif part number, please include it with your message.